It is a Digital Meter Red Led Display Digital Ammeter Current Monitor/Tester, Measure Current Range:.. It's a ammeter,small size, high accuracy,shell designed. Measuring DC 0.0A to 100A. Can (without a s.. It's a 100A/75mV Shunt,Length: 20.9cm,Shunt Main By Manganese copper And Copper connectors Welding C.. It is a Red LED Ampere Meter With Current Shunt Resistor,Measurement Range:DC 0-100A,Power Supply:DC.. It is a Digital Voltmeter Ammeter/2in1 Tester, Operating voltage: DC 4.5 ~ 30Vm, Measure Voltage Ran.. It is a 2in1 Volt Amp Panel Meter, Measure Voltage Range DC 4.5-30V,Measure Current Range:0-50A forw.. It is a 2in1 Volt Amp Panel Meter, Measure Voltage Range DC 4.5-30V,Measure Current Range:0-5A forwa.. It is a 2in1 Volt Amp Panel Meter, Measure Voltage Range DC 4.5-30V,Measure Current Range:0-10A forw.. It is a 2in1 Volt Amp Panel Meter, Power Supply: AC220V +/- 10%，Measure Voltage Range DC 0-19.99V,Me.. 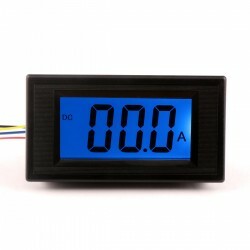 It is a 2in1 Digital Voltmeter Ammeter, Operating voltage: DC 4.5 ~ 30V, Measure Voltage Range: DC 0.. It is a 2in1 Digital Meter/Voltmeter Ammeter, Voltage Measuring Range: DC 4.5~100V, Current Measurin.. It is a 2in1 Digital Meter/Dual display Voltmeter Ammeter, Operating voltage: DC 4.5 ~ 30V, Measure ..